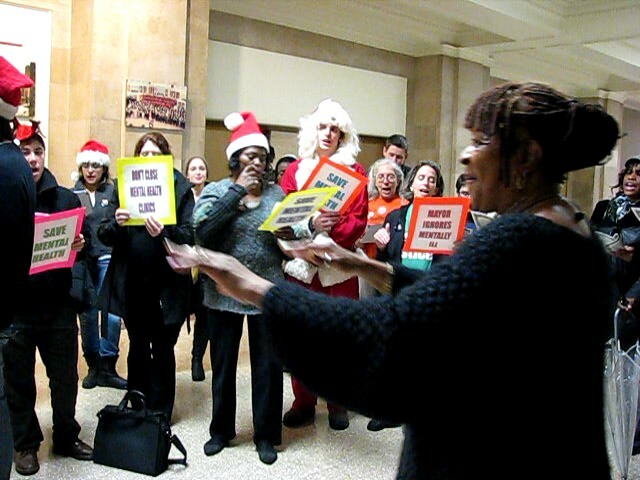 Members of the Mental Health Movement also urged City Council members “to do what’s right this holiday season,” by holding hearings on clinic closures and delaying the closures pending an impact study. They also urged legislators to meet with people who use the mental health facilities to hear their stories. “It’s just ripple effect, the city as a whole,” Torres said. “And we’re just here to protest that privatization and closing is not the answer,” she said. 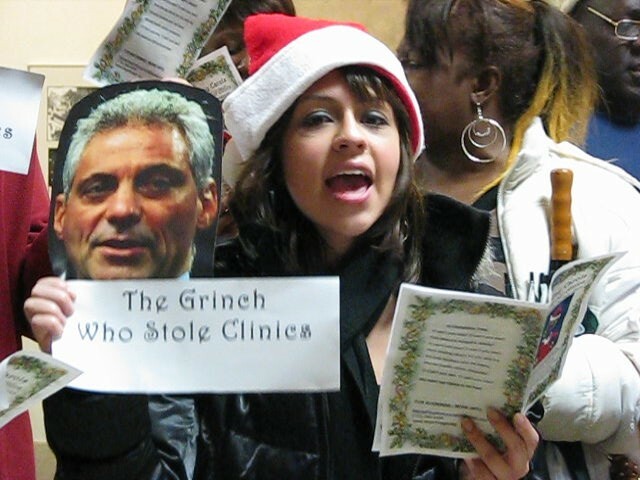 Some of the members performed a short skit in the hallway, depicting Chicago Mayor Rahm Emanuel as “The Grinch who stole clinics” instead of Christmas. The City Council voted to close six of the Chicago Public Health Department’s 12 mental health clinics, all of which are located in low-income communities of color. Linda Hatcher, 60, has been a patient for the past 24 years at the mental health clinic targeted for closure in the Woodlawn community. She has suffered a mental breakdown in the past and has been undergoing treatment for “postponed depression and bipolar” health conditions. 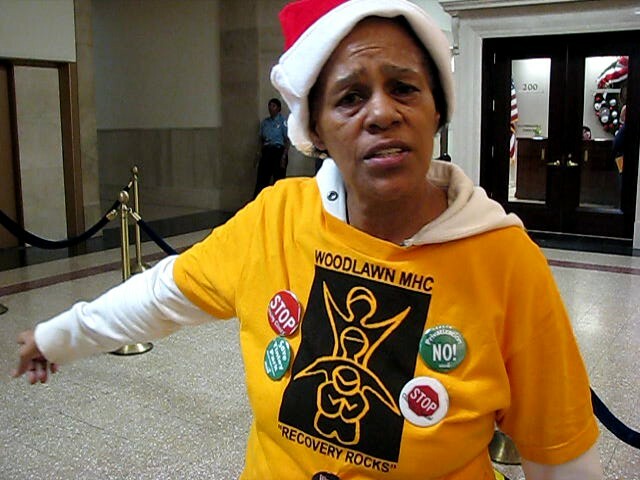 The Woodlawn clinic is close to her home and on the route of her commute on public transportation, and Hatcher added that she also has a daughter who suffers from bipolar disorder. “I’m a fighter,” Hatcher said after the protest. “I’m not going to give up that easy. By her having bipolar I help her out with my grandbabies and everything, and we need that clinic open. I’m going to fight, and they’re going to keep it open,” she declared. Hatcher said she has established a good relationship with her therapist at the Woodlawn Mental Health Clinic, which she didn’t want to be disrupted. “I talk to my therapist for my to put me right back on the right track cause I do fall off sometimes. But by me taking my medicine…it helps keep me together,” she said. We’ll resist your greed and might! And we’ll go down in history! Have you just a little bit of heart left? Don’t we have a say? With no rights or say at all. So closing clinics is heartless as we all can see! That we will lose some lives – HEY! While our clinics go away, hey! You must think we’re fools – HEY! O can’t you see? O can’t you see? O Can’t you see, O can’t you see? We need our clinics to be free! On the first day of Christmas the Mayor took away, public health from the city. On the second day of Christmas the Mayor took away, our therapists and public health from the city. On the fourth day of Christmas the Mayor took away mental health clinics, all our meds, our therapists and public health from the city. On the fifth day of Christmas the Mayor took away, all our hopes and dreams, mental health clinics, all our meds, our therapists and public health from the city. On the sixth day of Christmas the Mayor took away all of our jobs, all our hopes and dreams, mental health clinics, all our meds, our therapists and public health from the city. On the seventh day of Christmas the Mayor took away 7 health centers, living wage jobs, all our hopes and dreams, mental health clinics, all our meds, our therapists and public health from the city. On the eighth day of Christmas the Mayor took away 8 public schools, 7 health centers, living wage jobs, all our hopes and dreams, mental health clinics, all our meds, our therapists and public health from the city. On the ninth day of Christmas the Mayor took away public libraries, 8 public schools, 7 health centers, living wage jobs, all our hopes and dreams, mental health clinics, all our meds, our therapists and public health from the city. On the tenth day of Christmas the Mayor took away any hope of learning, public libraries, 8 public schools, 7 health centers, living wage jobs, all our hopes and dreams, mental health clinics, all our meds, our therapists and public health from the city. On the eleventh day of Christmas the Mayor took away NATO protest permits, any hope of learning, public libraries, 8 public schools, 7 health centers, living wage jobs, all our hopes and dreams, mental health clinics, all our meds, our therapists and public health from the city. On the twelfth day of Christmas the Mayor took away, any chance of re-election, NATO protest permits, any hope of learning, public libraries, 8 public schools, 7 health centers, living wage jobs, all our hopes and dreams, mental health clinics, all our meds, our therapists and public health from the city! This entry was posted	on Thursday, December 15th, 2011 at 10:23 pm. You can follow any responses to this entry through the RSS 2.0 feed. You can leave a response, or trackback from your own site.